The Sega Saturn Modem (セガサターンモデム) is a modem attachment for the Sega Saturn which allows the system to connect to the internet. It was only released in Japan, with its North American, equivalent being the NetLink Internet Modem. The Sega Saturn Modem is a grey 14.4kbps modem designed to be placed in the Saturn's cartridge port. 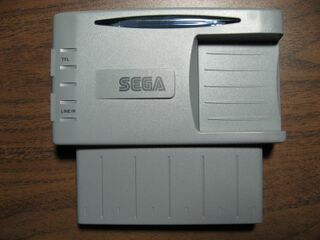 Little is known about the Sega Saturn Modem performance in Japan, however the unit was engineered slightly differently to the NetLink modem, with a card "holder", designed for use with "Saturn media cards" (priced at 2,000 yen each) containing pre-paid credits. One game credit was worth roughly 20 yen. The Sega Saturn Modem is built upon the XBAND technology for North American Sega Mega Drives. It was originally bundled with Sega Saturn Internet Vol. 1 (software that allows access to the world wide web and email), the SegaNet version of Virtua Fighter Remix (not sold separately) and Pad Nifty. Later it was released with Sega Saturn Internet 2 and the SegaNet version of Virtua Fighter Remix and Decathlete. The latter version is extremely rare. There are more Japanese games which make use of the peripheral than US games using NetLink. Games that support it sport a "SegaSaturn Networks" logo on the box.